Make getting sleep a priority. Try to rest whenever your baby is sleeping. Babies usually have one sleep period that's longer than the others. Try to sleep then so you can get as much sleep as possible at one time. Many babies develop a somewhat predictable sleep pattern that will guide you. Stay dressed for rest until you've gotten the sleep you need for the day. Staying in your sleepwear sends a reminder to yourself and others that you need to rest. If you don't want to remain in your sleepwear, choose clothing that's comfortable to sleep in. Make your bedroom a place for sleep. Don't turn on the TV. Turn the phone ringer off. Keep the room darkened when you're trying to sleep during the day. If your baby's sounds and movements keep you awake, consider putting the crib or cradle in another room. 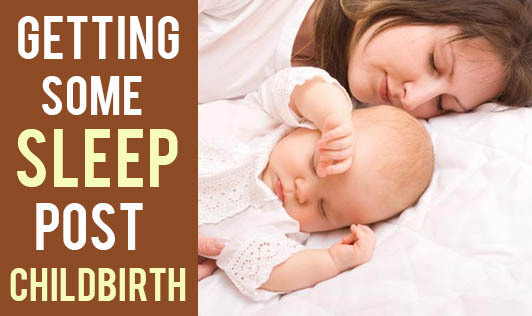 - Take advantage of the calming effects of breastfeeding and go back to sleep as soon as the feeding is over. Ask your partner or support person to change the baby and settle her. - Consider keeping the cradle next to your bed so you can slip your baby into it at the end of the feeding. - If someone is staying with you, ask that person to take the last night shift or first morning shift. Having someone else take care of the baby after a feeding means that you can stay in bed. - Alternate nights with your partner regarding who will feed and take care of the baby. That way one of you can get more sleep. - Consider asking someone else to feed the baby so you can sleep through that feeding.